As a doctor, your specialty is caring for people, and marketing or sales are likely not subjects you studied extensively in school. Despite that, these business skills can help you get the most out of your medical practice, and the more you learn, the more you can do. One way you can increase per-patient profitability in your cosmetic clinic is with the cross-sell, helping you not only enhance your medical practice but also helping your patients discover products and services that can benefit them. When you do your cross-selling right, everybody wins. While an up-sell involves offering your patient an upgraded version of their treatment, a cross-sell involves offering your client a related product or service along with the treatment they have already booked. For example, offering to treat perioral wrinkles along with lip augmentation would be an up-sell. 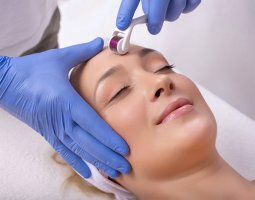 Offering a hydrating facial treatment after a cosmetic treatment or offering skincare products for your patient to take home would be a cross-sell. Cross-sales help you increase the value of each patient visit by expanding your offer to meet your patient's many skincare needs. 1. Put it on display. Many patients may not realize you offer additional skincare products for sale, and that is where a display in your reception area is helpful. Keep it organized and keep it pretty, giving the visual appeal that will help draw your patients over as they wait for their treatment. Organize products logically: cleansers, then toners, then moisturizers, with acne products in one area and anti-aging products in another. Grouping related products together can help your patients find the product they need and discover other complementary products. Keep the products accessible, on or in front of the counter, where patients can explore the packages at their own leisure. Knowing your patient's skin concerns, and the treatment they have booked, can help you select related products in advance. Some clinics may have a basket ready for each client containing, for example, rosacea products for those who have that skin condition or acne products for the younger patients. Planning ahead like this prevents scrambling last minute to find the products you want to introduce to your patients. Everything will be all ready to go when your patient finishes their cosmetic treatment. 3. Don't sell. Offer a benefit. Your patients likely do not want a sales pitch from their doctor. Instead of selling them random products, take time to understand their needs, then show them a product which complements their chosen treatment and offers them a benefit. For example, if they have visited your clinic for a chemical peel to alleviate their acne, recommend an acne-focused cleanser and at-home blemish treatment. Explain what the products are and how to use them, and let your patients know the benefits of continuing to care for their skin at home. After all, the better they take care of their skin between visits, the less-invasive their in-office treatments will need to be. 4. Leave recommendations to the experts. Your patients trust you and your nurses as expert health professionals. Instead of relying on your patient discovering a product display in your waiting room, or having your receptionist sell them a product, take a more hands-on approach. Let your patients know the products you are recommending them are products that you believe, as a health professional, will benefit them. Explain to your patients how medical-grade skin creams, for example, are better than store-bought products and how they can help improve your patient's skin. 5. Give your patients the inside scoop. Your expertise can help your patients discover something new. Your patient may have a problem that a particular product can solve, but since they have never heard of the product, your patient has no idea the solution even exists. You have an opportunity to educate your patients about new products or treatments that can benefit them. Let them know what is new in the world of cosmetic surgery and dermatology, and if it is something they need, then you both win as they improve their skin and you provide an extra treatment or product. 6. Offer patients a deal they cannot resist. You know those commercials that tell you to call within the next ten minutes to get a special offer? They work, and the same technique can help you, too. Your patient may be interested in what you have to offer, but they may hesitate, thinking they can just get it later. By offering a limited-time deal, you are giving them an incentive to make a purchase now instead of later, while also helping them save money. For example, you could offer a special flat price or 10% discount on products they purchase at the time of their cosmetic treatment. This not only offers an incentive for your patients to buy now but also helps them feel good about getting a bargain. Who doesn't love a bargain? 7. Pay attention to your patients. Now is not the time for a hard sell. If your patients are resistant to the cross-sell, avoid pushing them. Doing so could backfire, jeopardizing your relationship with your patient and any future treatments they may need. Simply offer the item, explain the benefits, and let them decide whether the product or treatment is right for them at this time. Answer any questions they have and support them in whichever decision they make. There are a variety of products and services you can cross-sell in your cosmetic practice. A hydrating facial mask, for example, can help cool and soothe your patient's skin after their facial injections. Skin cleansers, moisturizers, and other at-home treatments can help your patients maintain their skin between appointments. Special products, such as eyelash enhancers, can help your patients improve other areas of their face. It is important to consider your patient's individual needs when deciding which products and treatments to cross-sell. If the product selection is tailored especially to them, they get something to their benefit, and you increase your medical practice's per-patient profitability. Everybody wins with a cross-sell done right. Medica Depot carries a wide variety of facial masks, eyelash enhancers, and professional-grade skincare products for your patients to use at home. To learn more about ZO skincare and other products, visit MedicaDepot.com or phone one of our knowledgeable customer service representatives today.